Until last year, I didn't know green beans' season. I didn't even know they had a season. I saw them in the grocery store pretty much year round, so I assumed they were one of those magical vegetables that could grow through the frost. Not so: green beans have a season, and that season is right now. Take a closer look at the green beans at your local market, and you'll quickly notice the difference between them and the ones your grocery store displays during other times of the year. Summer beans are a light, bright green. their pods are smooth and taught, and when you bend one, it only goes so far before that satisfying *snap. * Looking at the pod, you shouldn't be able to tell where the beans are within. If the beans protrude enought that they betray their shape through the pod, that green bean is either out of season, or very old. I usually think of green beans as a side dish. I cook them szechuan-style to serve in rice bowls, blanch them and serve with pesto alongside a belly of salmon, and add them to green salads to lend some heft. But with a few flourishes, green beans can be the star of the show. Now that they're hitting their stride, I've taken to blanching a few pounds at once, keeping them in the fridge, and using them in different weekday lunch options throughout the week. This dish is a recent favorite. Yes, cherries--again!--because, well, I can't get enough. These ones are dried, and if you can't find dried cherries, you certainly can substitute raisins, currants, or cranberries. As for feta, please use the full-fat stuff. and good-quality If you live in the Mid-Atlantic, I really love Keswick Creamer's Feta de Provence and Feta with Dill and Chives. If not, look for a rich, creamy feta whose flavor you enjoy alone. You could easily double the vinaigrette recipe and store it in a jar on the counter (or, if you're particularly nervous about food safety, the fridge). With pre-blanched green beans and ready-to-go vinaigrette, this is weekday lunch at the ready. Bring a large pot of salted water to a boil over high heat. Fill a large bowl with ice cubes and water and set aside. Add green beans to boiling water, cover, and cook 2-3 minutes, until green beans are crisp-tender. Check a green bean at 2 minutes and 2:30 to check for doneness - don't let these beans go limp. As soon as beans are perfectly crisp tender - and not a minute later - strain beans into the bowl of ice water to "shock" them: this stops the cooking immediately and preserves the beans' bright green color. Strain beans out of ice water and blot dry with a towel. Dump ice water. Transfer back into the bowl that contained the ice water. 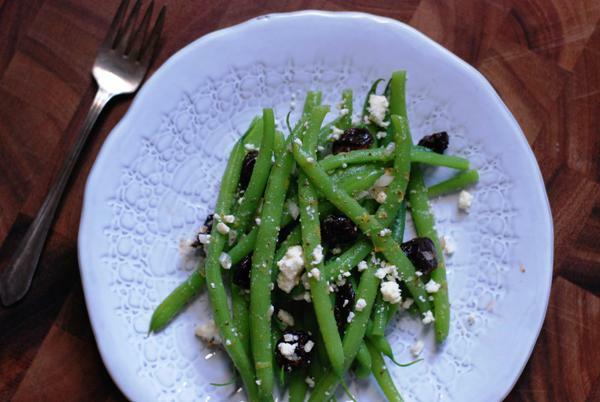 In a small bowl, combine all ingredients except feta and cherries. Whisk with a fork to combine, then pour over beans and toss until all beans are coated with the vinaigrette. Fold in cherries and feta cheese, taking care to keep some chunks of feta along with all the smaller bits. Serve. The salad will keep well for several hours, so you can prepare it in the morning and eat it for lunch. If making more than a few hours in advance, pack vinaigrette separately from other ingredients, and mix in just before eating.